Couldn’t be more thrilled with this purchase! It exceeded my expectations. Very high quality fabric, yet has the beautiful Victorian appeal of a tapestry pillow. The cat image has a lot of character! Colors and image of the cat are exactly as shown. I will definitely be ordering more to add to my collection! PURRfectly ADORABLE! 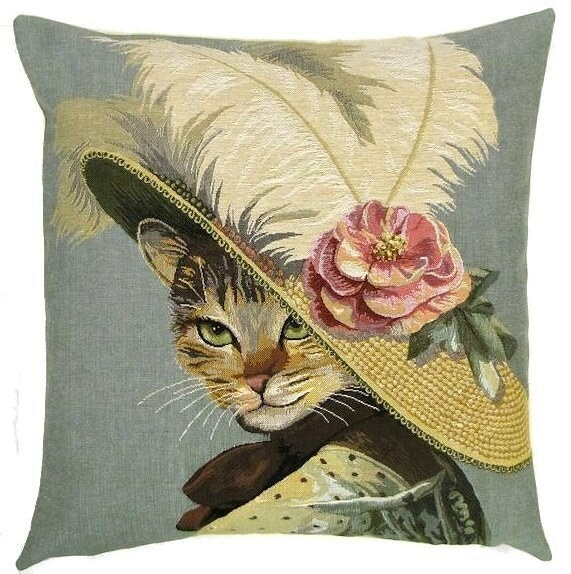 This lady cat with the pink rose and white feathers in her chic hat has such the PURRsonality to match! This is our 4th cat tapestry pillow cover, and they are absolutely charming and make us SMILE :) every time we see them! Great job in shipping too.... wonderful transaction.......YAY! Five PAWS way up!!!!! High quality and absolutely gorgeous. Beautiful rendition of a charming cat in a hat. The colors are especially lovely.